David explains, "oddly we did in fact get charged real money, but luckily they tasted a lot like chips…"
Are they running toward cow chips? And, why are they sorry? 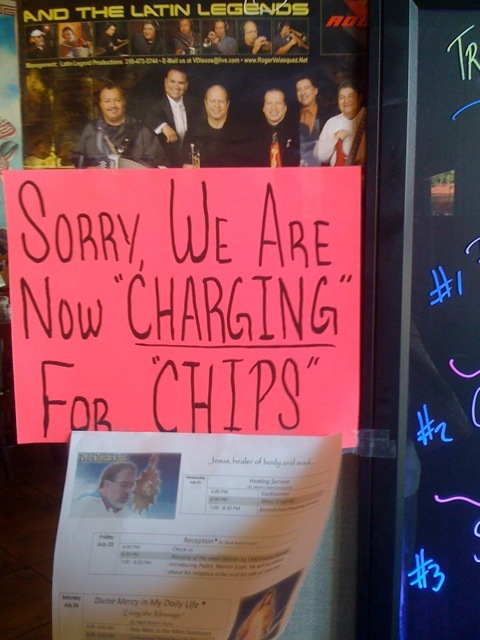 Usually in the U.S., "chips" means potato chips. These are tortilla chips. Since many restaurants have served them free, I can see why they apologize. That doesn't explain "charging," tho. 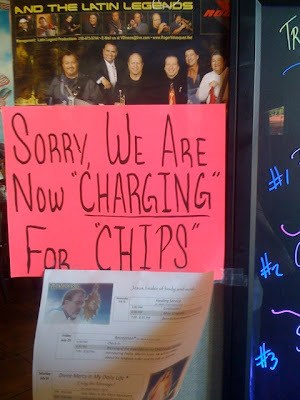 WV: reashr -- How reashring that some people understand punctuation. I don't buy your suggestion that "chips" implies potato and not tortilla. I think it works for both.